MAGIC BANDS…now I’m a believer! If you read the first review of this report, you know that I’d already experienced my share of Magic Band trouble on this trip…and sadly, there would be more trouble yet to come. However, after spending one day at the Universal parks where instead of wearing one Magic Band I had to carry four cards, I am now totally on board the Magic “Band”wagon! To further explain, at Universal there is your park ticket, which of course you need in order to enter the parks. 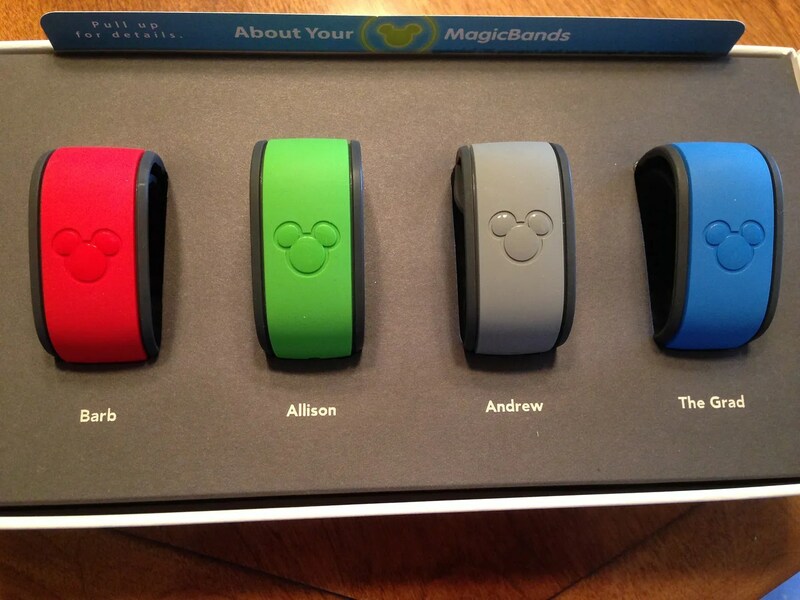 For Disney resort guests, the park ticket has been replaced by the Magic Band. 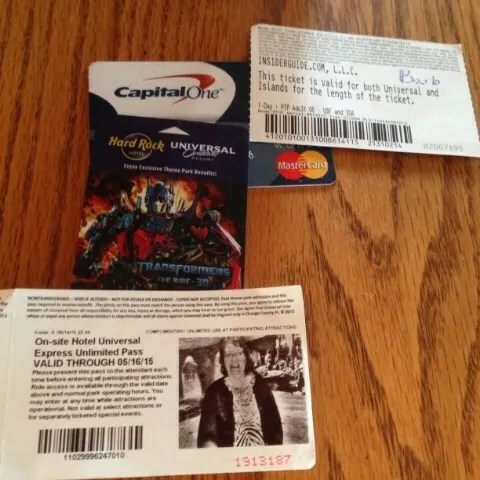 Then there is your hotel room key card, which in addition to opening the door to your hotel room, must be shown in order to gain early admission (one hour prior to the regular scheduled park opening time) to the Wizarding World of Harry Potter area at Islands of Adventure. This is a perk available to all guests of the four Universal hotels. Again the room key card has been replaced by the Magic Band at the Disney hotels, both for entering your room and entering the parks during Extra Magic Hours. Then, because you only have charging privileges within your hotel and not at the theme parks, you must also carry cash (or a credit/debit card) in order to make any purchases. Once again, the Magic Band is all you need at the Disney parks as long as you are willing to leave your credit card information on file at your Disney resort. And last, the guests of all of the Universal hotels (except for Cabana Bay) also are issued an Universal Express pass which can be used to bypass the regular line for some of their rides (similar to the Fast Pass line at Disney). And speaking of Disney’s Fast Passes, access to your Fast Pass choices is easily attained with the touch of your Magic Band, which eliminates the need to carry around a separate Fast Pass ticket. So what is the point to my rant? My point is that with 4 of us that meant 4 park tickets, 4 hotel key cards, and 4 Express Passes to keep track of. And what does 4 + 4 + 4 equal? Yep, it equals 4 Magic Bands! Ok, stepping down from my Magic Band soap box now and moving on to our day at the Universal Studios theme parks. We had three primary goals on this day…Harry Potter & the Forbidden Journey, Hogwart’s Express, and Harry Potter & the Escape from Gringotts (and FYI, on none of these rides could we use our Universal Express Passes ). Despite my daughters nearly coming to blows over a “sunscreen in the hair” incident we somehow managed to make it to the park entrance shortly after 7:00 a.m., the Early Admission time for that day. Therefore, our first goal of riding the Forbidden Journey was accomplished pretty quickly. We had visited Universal Studios in August 2010 so had already done this ride a few times. However, we all enjoyed riding it again…some more than others. SPOILER ALERT: One of us is deathly afraid of spiders! We were greeted at the entrance to Gringotts Bank and told that the ride was currently down but we were welcome to enter the line anyway, as they expected it to be up shortly. So we did. And we waited, and we waited. When we were about ready to give up, the line finally starting moving at a fairly steady pace…the ride was up and running! …when the line came to an abrupt stop and an announcement was made that the ride was again down and would be down for awhile. We were asked to leave and return later and each given a “fast pass-like” ticket to skip the regular line whenever we did return. So we left and went in search of breakfast, which in Diagon Alley could be found at the Leaky Cauldron. 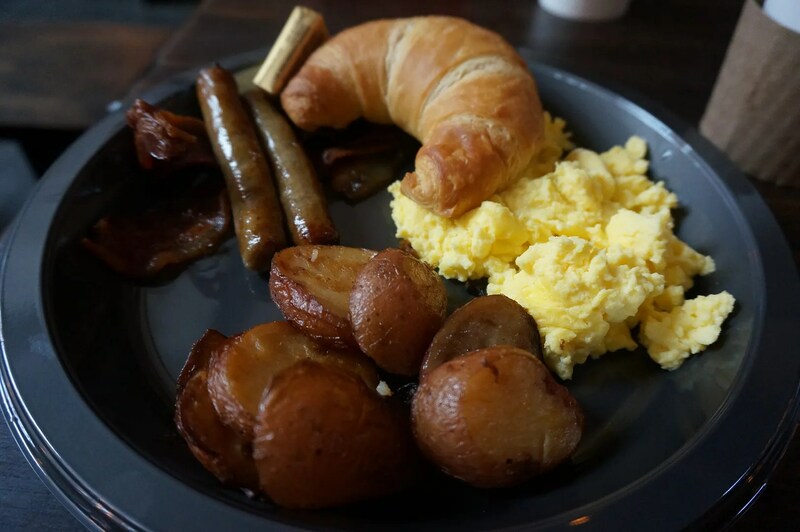 Andrew thought this breakfast platter was just okay and only rated it a 3. But Allison and I both rated our breakfast a 4, as it all tasted pretty good to us. 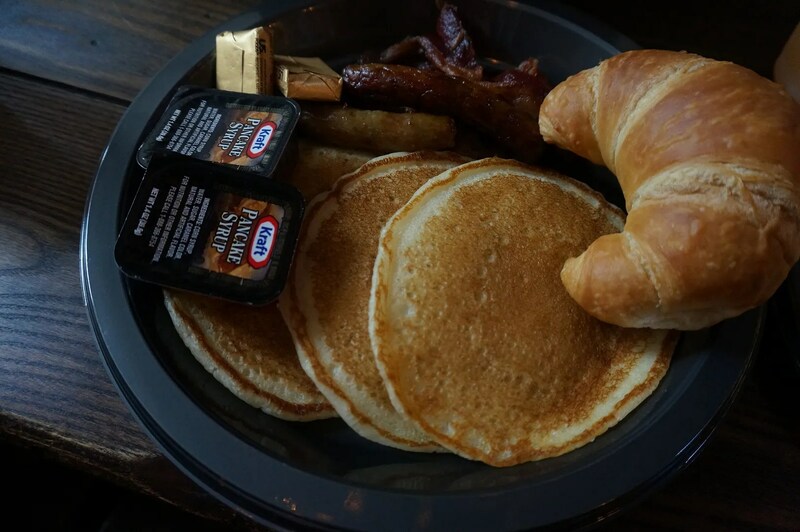 This was similar to the breakfast platters that you get at many of the Disney quick service restaurants, except the Disney platter usually includes a biscuit plus either french toast (slice or sticks) or a Mickey waffle instead of a croissant. Another difference is the price. 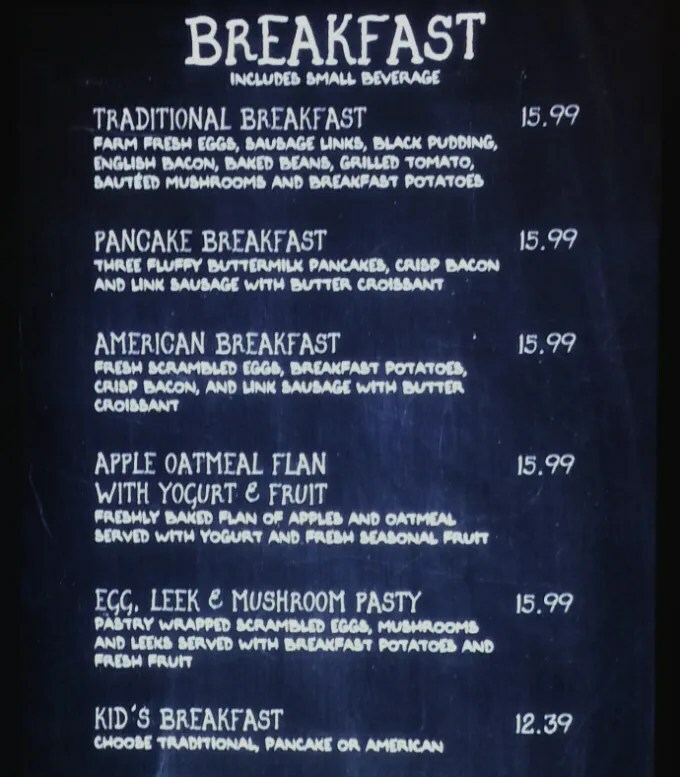 The Disney breakfast platter at an in-park restaurant, such as Epcot’s Sunshine Seasons, is only $8.99. 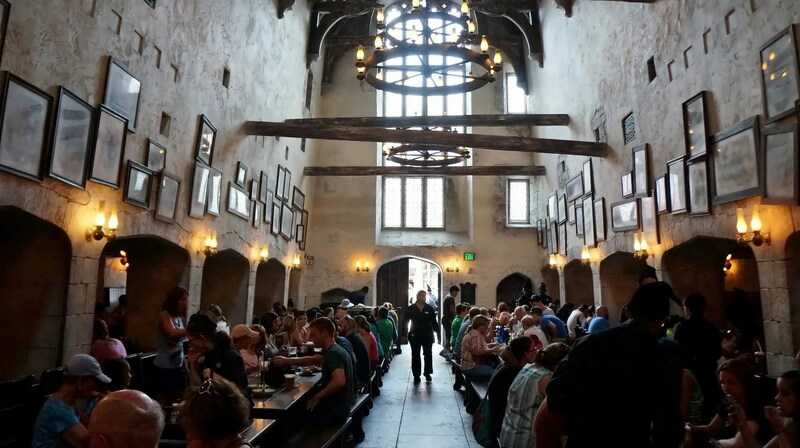 However, I’m willing to give Universal a pass on this one, as it’s not often that you get to step inside a much-loved book/movie series to share a meal with your kids. 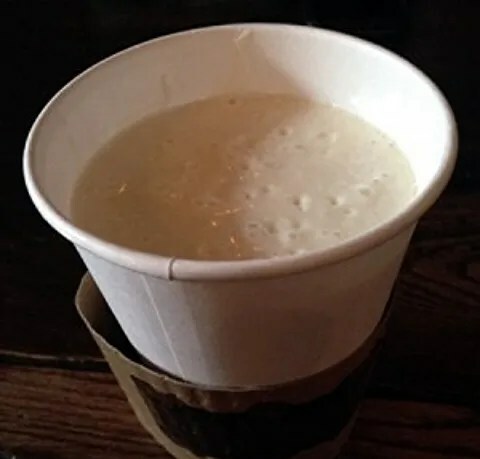 Unlike the Disney breakfast platters, the Leaky Cauldron breakfasts came with a drink, which for Allison and me was coffee. Andrew’s beverage choice was much more unique though. His warm Butterbeer was definitely the hit at our table. For those that have yet to try butterbeer, to me it tastes like butterscotch flavored cream soda topped with whipped cream. 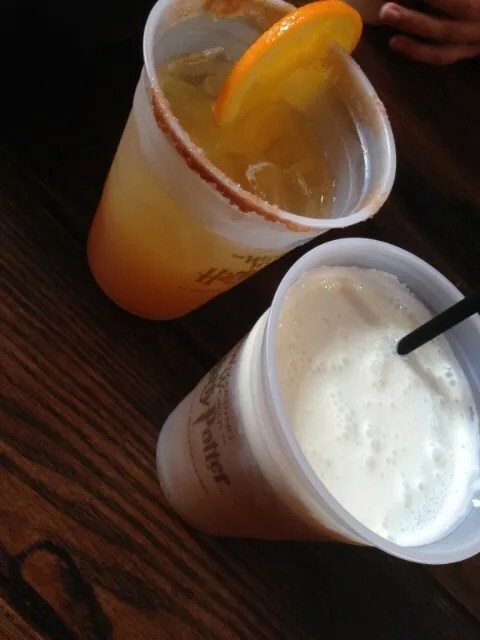 While it is very good frozen, especially on a hot Florida day, the four of us agreed that the butterbeer was even better served warm. I definitely regretted having gotten coffee rather this cup of buttery, sweet deliciousness. Also pictured in the above photo is Emily’s beverage choice, orange juice…or the fancy name for it here was Otter’s Fizzy OJ. As you can see, this was served on the rocks with an orange slice and cinnamon rimmed glass. She also ordered a side of scrambled eggs (not pictured) for an additional $1.99. Like Andrew, Emily thought her breakfast was just okay and rated it a 3. So overall I would have to say that our breakfast ratings were probably influenced by our degree of excitement with the surroundings. Allison and I are both big fans of the Harry Potter series of books and movies, while the other two like Harry Potter but to a lesser degree. Following our breakfast at Leaky Cauldron, we returned to Gringotts to see if the ride was running again, which it was. We used our passes (that we were given when the ride went down) to bypass the long line and were able to board the ride fairly quickly. And let me just say, this ride was a 5 for all of us! I wish we could have ridden this a second time, but unfortunately because the ride had been down for most of the morning the regular line was incredibly long. So we moved on to another area of the Universal Studios park, where we were finally able to use our Universal Express Passes to ride Men in Black. Well, three of us anyway. Emily did not have any pockets that day so gave her Express Pass and her hotel key card (I kept everyone’s park ticket) to her brother to carry in the pocket of his shorts. Before getting into the Express Line for Men in Black, he reached into his pockets to retrieve their passes and hers was missing, as was her room key card. There was a hole in one of the pockets of his new shorts! We walked into a nearby store to find out how we could get a new Express Pass and were told that because she also lost her room key card, this could only be done back at our hotel. So she returned to the Hard Rock to do this…and never returned. Apparently the walk back to the hotel was so hot and tiring that she decided to take a nap in our air-conditioned room rather than returning to the park. So her 3 rides cost me $50 each. Ouch! The three of us then rode Men in Black and Transformers before running into yet another stumbling block at the Despicable Me ride. Once again the ride was down and we were given fast pass tickets which could be used on any other ride at either of the parks. 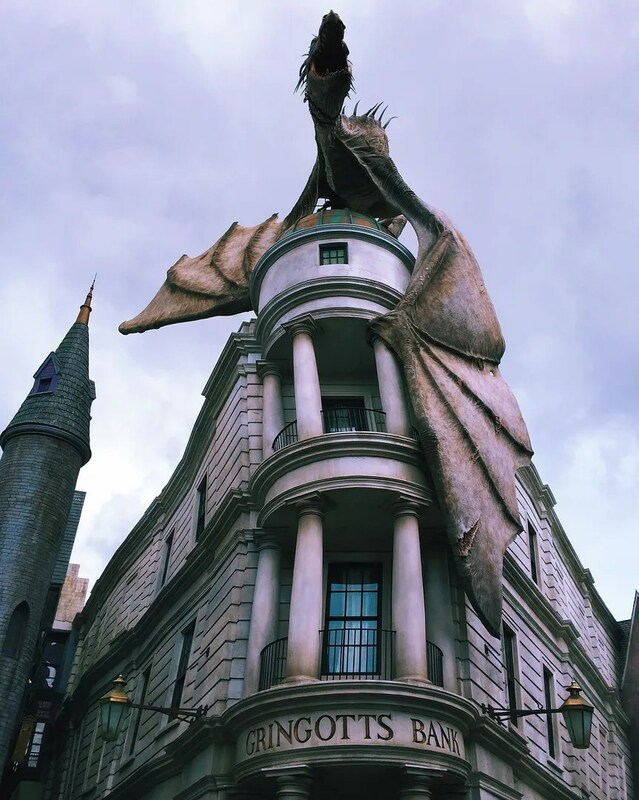 We decided to try to use these to ride the Gringotts ride again, but guess what? Yep, the ride was down again. At this point, I was hot, I was tired, I was done…took the boat back to the Hard Rock and joined Emily for nap time in our room. But despite the extreme heat and the frustration over the many ride break downs, Allison and Andrew soldiered on. They decided it was roller coaster time, first riding Hollywood Rip Ride Rockit at Universal Studios then returning to Islands of Adventure to ride the Incredible Hulk and the Dragon Challenge. 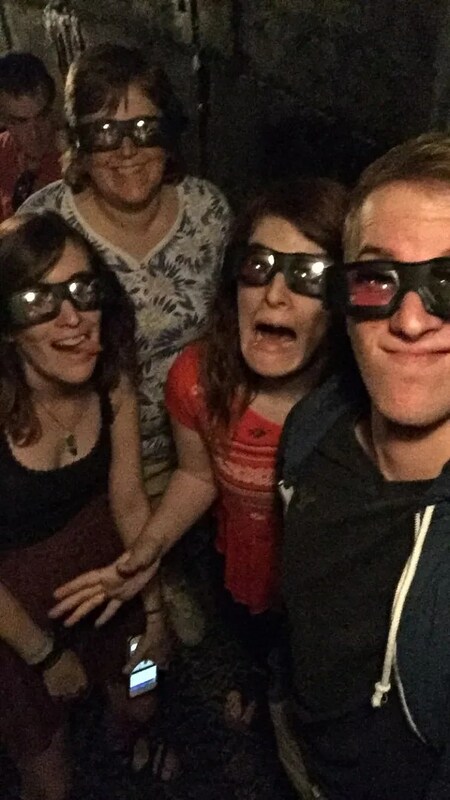 Then they used their fast passes from Despicable Me to ride The Forbidden Journey…well, kind of. The ride came to a complete stop not long after they boarded. The lights were turned on and they sat…and sat. Finally the ride started moving but the lights remained on. And then it stopped a second time. When they finally got to the end of the ride, they expected that they would be giving out fast passes to either return later when the ride was fully functioning or ride something else. No such passes were given out though. Since this was their 4th time riding this (rode it twice during our 2010 trip) and they hadn’t had to stand in line long, it was not a huge deal for them. But they felt really bad for those who were first-time riders and/or had stood in the long line, only to have a sub-par ride experience with the lights on and with two long stops. After this they too were ready to throw in the towel and returned to the hotel. One more gripe to air regarding our experience at the Universal Studios park…MANDATORY LOCKERS! I carried a purse-size bag into the parks, the same one that I take onto all of the Disney rides. However at Universal, with the exception of the train ride and possibly one other, I was required to place my bag in a locker before being allowed into the line. Though the lockers were free (for a limited amount of time), it was still a pain to do this each time I wanted to go on a ride. And in most cases it did not even seem necessary. For instance, the Men in Black ride is similar to Buzz Lightyear at Magic Kingdom. Like on Buzz, there was plenty of room to set a bag or backpack on the floor of the ride vehicle. I suppose though that they do this to avoid the problem of having bags left behind on the rides, but to me it just got to be tedious and time-consuming. So there you have it, my review of our one day Universal Studios experience. While I love the two Harry Potter themed areas, the minor inconveniences and more importantly, the many ride break downs, caused my small taste of the Universal parks to be just a bit sour. However, the sour taste in my mouth was soon remedied at the Rock Royalty lounge.